Of all the superheroes in the Marvel and DC pantheon, Superman was always one of the hardest to write for. The character is iconic - he has God-like powers and near invulnerability, and is completely milquetoast in his civilian persona of Clark Kent. How does one craft a compelling story that hasn't been done before in previous movies, television shows and cartoons, or old serials? To resurrect him from movie limbo, DC recruited Bryan Singer, the man who was wildly successful in bringing Marvel's X-Men to the big screen. After all, DC was sitting on a goldmine in potential profits while Marvel had much more success (and some misses) in bringing translating their characters to the big screen. Singer (X2, X-Men) started by paying homage to what came before him. He uses the same style of opening credits and much of the same, soaring John Williams score. Noel Neill and Jack Larson, the original Lois Lane and Jimmy Olsen from the black and white movies make quick appearances. Even Marlon Brando makes an appearance, courtesy of modern computer imagery. And in a unique twist, Singer and screenwriters Michael Dougherty (X2) and Dan Harris (Imaginary Heroes, X2) place the movie after Superman 2. This means that Superman 3, and anything afterwards, did not happen. For some, this may be a good thing. They also infuse a pulpy feel to it, mixing in small comic lines with their more serious story, giving in an old-fashioned comic book feel. 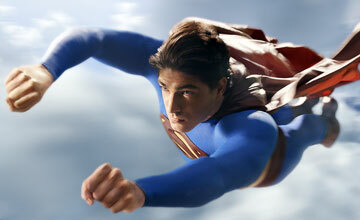 Superman (Brandon Routh) returns after a five-year absence in space, only to find that the world around him has moved on. It's a great setup for a story. Unfortunately, nothing really happens. All the pieces seem to be in place perfectly. Superman is still a great big Boy Scout, and his alter ego, Clark Kent, is still a bumbling Kansas farm boy. Lois Lane (Kate Bosworth, Bee Season, Beyond the Sea) is still a plucky reporter. Lex Luthor (Kevin Spacey, Beyond the Sea, The Life of David Gale) is still villainous. But the story is thin, and not worth paying attention to. Worse, stretching it out to over two and a half hours makes things move slower. If Singer pared down the film by an hour, it would have been much better. Once back home, Superman tries to piece his life back together. As he tries to change public opinion, which rapidly deteriorated after he left, Luthor steals an advanced piece of Kryptonian technology. Meanwhile, Lane now has a young son (Tristan Lake Leabu) and is engaged to Richard White (James Marsden, X-Men: The Last Stand, Heights). Not only does Superman need to convince the public that he is back for good, he also has to win back the heart of Lane. Routh looks eerily like the late Christopher Reeve. Otherwise, Bosworth and Spacey are decent, but not much more than that. The main reason that Singer and company started the movie after the first two sequels was to move on. Everybody knows Superman's origin. Why tell it again? However, with the way that Superman Returns drags, it feels like little more than a setup for the inevitable sequel. 2 hours, 34 minutes, Rated PG-13 for some intense action violence.